The tanks prepare for action. The commanders confer one final time. Panzer Expansion #3 shifts the action to the Western Front where US and British forces drive the beleaguered German units across Western Europe and into the very heart of Germany. The Reference and Scenario book includes a host of new optional rules covering Staggered Initiative, Spot Removal, Delayed Reaction, Bocage Country, Defensive Fire and many others including complete rules and reference tables for airborne and glider operations. A few new special units, like the Churchill Crocodile flamethrower tank, stoke up the action to a new level. You will find no less than twelve versions of the Sherman tank in both US and British livery, Cromwell tanks, Hellcat, Jackson andAchilles tank destroyers, Greyhound and Humber armoured cars, anti-tank guns, four new aircraft and many others. The Germans are also well represented with the Marder III, StuH 42, Jagdpanther, Jagdtiger, Hetzer (including the flamethrower version), SPWs, PSWs, and more. 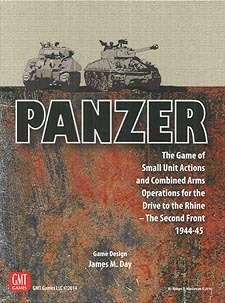 The ten scenarios include seven historical-based and three actual historical scenarios that cover a wide range of action on the Western Front between US, British and German units, including the two clashes between the British 7th Armoured Division, Panzer Lehr and the SS Tiger tanks at Villers-Bocage. Also included is a detailed TO&E book outlining eight US and British (Commonwealth) divisions. The German formations include Panzer Lehr, two Panzer Brigades and s.SS-Panzer Abteilung 101. Important note: in order to play this expansion, you will need a copy of the basic Panzer game; ownership of Panzer Expansions Nr1 and Nr2 is not required.